Thank you God, for one more year. A year spent well and wisely with You. I am not surprised this is so beautifully written and expressed. I want to jump on your coat tail and say, "Me too!" Have a great day, dear friend. I missed all of the plaid fashion activity. Happy New Year! Love the branches decorated like that!! FARHER ... bless this woman who is so devoted to You and the family You blessed her with. Happy White Wednesday & Happy New Years too. Love the watch faces. Debra, i so agree. time cannot be purchased or returned and is SUCH a gift from God! Happy New Year to Come! What a beautiful well written and decorated post. I loved it. Have a Blessed New Year. Thank you for this wonderful post. Time is a precious gift. I'm learning that more and more with each passing year. I love your "time tree". What a wonderful project! I may have to make one myself. Just as a reminder of how beautiful and precious time really is. Oh my goodness - your photos are gorgeous!!! I love the time pieces!!! I can't believe this year is gone... what a year! Part of me is like "oh no! i didn't get everything done!" and the other part of me is like "bring it on - i'm ready!!!" anywho - Happy New Year!!! What a sweet post. I use to always feel like I didn't have enough time. I'm learning not to rush through life and to enjoy the little things that make it special. This is such a wonderful post. And point on. Blessings to you always! Good Morning Debra. Just a perfect post. 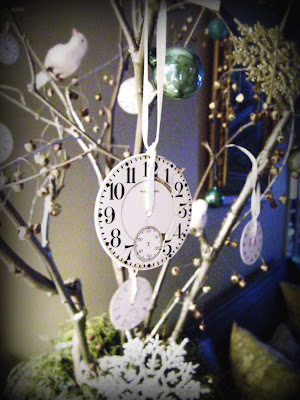 I love the timepiece tree. It's gorgeous. The tree is lovely idea and the prayer hit home. Thanks for sharing your thoughts with us in the days approaching the new year. What wonderful words. Your tree is very pretty. I tried to do a all white Christmas arrangement. I guess I just do color best. Something beautiful happens when you take breathtaking photos and add words to them. It's a book-magic thing! Truly Holy Spirit breathed. Beautiful words to live by...Have a Safe and Happy New Year! What a beautiful tree! I love the way you captivate the essence of the moment both visually and in word...thank you! This is so sweet. I love our traditions, and I Love You Too! Wishing you the happiest of New Year's! So beautifully written and such gorgeous images Debra. My time has been well spent with you today, that's for sure! I'm so thankful for being given this past year and I ask the Lord to bless me with another to spend with my dear ones and you. You my friend are a such a blessing to me! I am so very thankful for the time you spend each week with us...Your posts are thought provoking and often touch my heart in some way or another. I wish you a blessed Happy New Year! I am thrilled that I have had the opportunity to get to know you...to call you my friend. You know, I really believe that you should see about getting some of you writing published. I am serious! You have such a beautiful way with words and with such dynamic meaning. You are certainly a mentor for me. I wish you a wonderful New Year, my friend. How beautiful! Beautiful thoughts and beautiful pictures. Pretty Blog...I love your tree. Blessings to you in the New Year! Your photos are lovely - I really like your "time tree" - it's so pretty. Happy New Year. Sometimes I want to ask for a few extra hours in each day, do you know what I mean? But knowing myself, I wouldn't use them wisely...I'd just use them to worry more, or fret about things I have no control over. You have been instrumental in helping me to realize what a waste of time it is to sweat the small stuff. To acknowledge just how fragile and precious life really is. You have taught by example, and for that, I thank you. p.s. I can't return your call 'cause my phone is dead! Trapped at work for several more hours, grrrr. Talk soon! A lovely post Debra...thinking of you and wishing you the best of the new year!!! Looking forward to lots more blogging with you in 2010! Lovely thoughts for the new year. All my best to you ad yours. Gorgeous whites! Happy New Year Debra, I hope 2010 is fabulous for you! Thank you dear! Beautifully said. Let's pray for 2010 to be the best year yet. Very inspiring post! I love how all your pretties look hanging from the branches. Beautiful. Best wishes to you in the New Year! Beautiful post, Debra. Happy you linked back to it. I didn't even really know what a blog was when this was written.